What Capacity Hot Chocolate Dispenser that you need? You know that we would like our customer can choice a best one hot chocolate dispenser for use, so i write these articles to show How A customer select their Machine. Hello, I’m writing to find out info on the 3L stainless steel hot chocolate machine. I’m a little confused by your website is this machine used to serve melted chocolate or hot chocolate milk. I used a hot coca machine for years but it only makes 64 oz at a time. I have a large family and usually make 3-4 pots a night when we have a get together. then hit start. But everything I’ve found with a bigger compactly than 64 oz. I have to hear the milk first it only stirs it. This is for a home use but like I said I have a large family and we do use it often. I will be making a purchase as soon as I find one that fits my needs. Thank you an have a blessed day. This is A email from customer that interest our hot chocolate dispenser, He have a pots hold 64 oz, but His big family need 3-4 pots a night in winter so he need a large capacity hot chocolate dispenser to use. 64 oz = 1920 ml = 1.92 liters, then 64 oz x 4pots = 256 oz, It means that 256 oz need 7.68 liters Machine. So that we suggest him to buy a 10 liters Machine to meet his requirement. 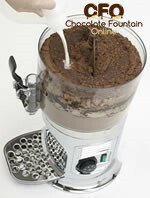 CFO offer 3 liters (100 oz), 5 liters (167 oz) and 10 liters (333 oz) capacity Hot Chocolate Machine that you can choice. Read Above Articles so that you know What Capacity Hot Chocolate Dispenser that you need. This article was posted in Dipping Ideas.